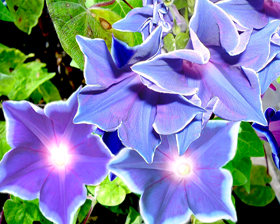 Ipomoea Nil Blue Picotee sports huge star-shaped blooms that are dark blue with a white edge. Provide a structure for this Morning Glory vine to climb and very soon you will have a vertical accent for your landscape and a profusion of 13cm blue flowers. Morning Glories are breathtaking vines to grow from flower seeds.